"Continuous" redirects here. For other uses, see "Continuous Card". Continuous Effects (Japanese: 永続効果 Eizoku Kōka) are a type of monster effect that applies while the monster remains face-up on the field. Some of these effects must meet additional requirements before they can be applied, and others may only be applied temporarily. These effects never "activate", and thus, do not start a Chain. 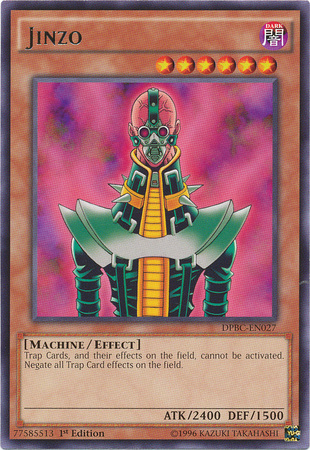 "Jinzo" and "Starduston" are two such cards with Continuous Effects. Since these effects don't start a Chain, they do not interact with effects that negate activations. However, they can still be negated by other card effects that negate monster effects that don't needing to respond to an activation, such as "Skill Drain", "Effect Veiler", "Junk Synchron", etc. Some Continuous Monster Effects only have an effect when specific requirements are met, rather than being applied as long as the monster is face-up on the field. "Bountiful Artemis", "Ancient Gear Golem", and "Steamroid" are cards with this kind of Continuous Effect. On cards using Problem-Solving Card Text, Continuous Effects are easier to recognize due to not using colons or semicolons. This page was last edited on 23 August 2016, at 01:17.